The popular Gold MAX virtual golf balls are back – FREE – but only until tomorrow! 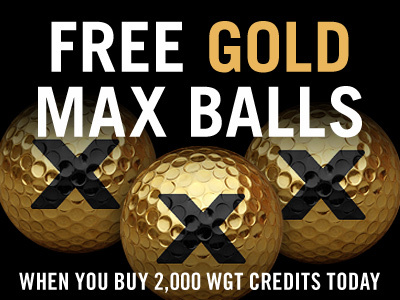 Get 3 free Gold MAX virtual golf balls when you buy 2,000 or more WGT Credits, now through 8/26. These are some of the most popular balls on WGT, in a special gold color with matching gold vapor trail to help you trace your shots through the air. Plus, the slower meter helps you "ding" more shots and lower your scores. Use your WGT Credits to upgrade your virtual equipment and compete in paid games and tournaments for prizes. The Gold MAX virtual golf balls will automatically be added to your inventory but not automatically equipped. To play with the new golf balls, just open your Equipment and equip them from your inventory. Note, these limited-edition virtual golf balls are no longer available to buy in the WGT Pro Shop so don't miss this! *Special one-time offer for players that buy 2,000 or more WGT Credits 8/25/16-8/26/16, get 3 free MAX Slow Meter Gold Vapor virtual golf balls (Hack+) on a single purchase. 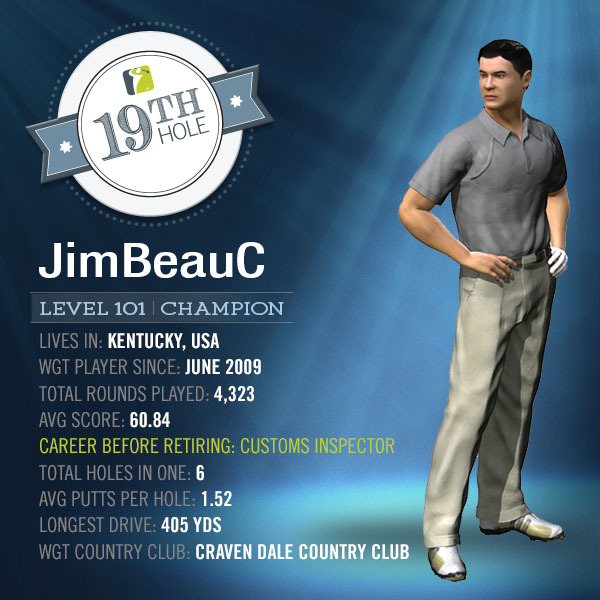 WGT 19th Hole - JimBeauC: "The Inspector"
The "WGT 19th Hole" series focuses on featuring the players, personalities and country clubs that make up the global WGT community. JimBeauC has been enjoying WGT since 2009 and was nominated by a fellow WGT Country Club member. Here is a short snippet of his nomination: "He is a fine (elderly) gentlemen with the highest integrity, intelligence and knowledge of the game and has supported me [...] throughout all the trials and tribulations a new club owner ever has to go through." "I found WGT while at work one day in 2009, signed up and played it a bit at work, that is until the Net Nannies nixed that. After I retired the next year, I came back and played a bit, but wasn't hooked. In November of 2011, I decided to see if I could get better at it. I finally discovered free credits, and started moving up. Then I hit Tour Pro. I had no idea how averages worked in WGT land. I had been getting a nickel or two from the main tourneys. I posted a bit of a rant about it in the forums. That's when I met MainzMan and eventually found a home at Bridgestone, where, with much help from the members, I steadily improved my game and learned some of the tricks. I sincerely doubt that I'd have stayed with the game were it not for the CC. Lo and behold, I became one of those who helped other folk along." 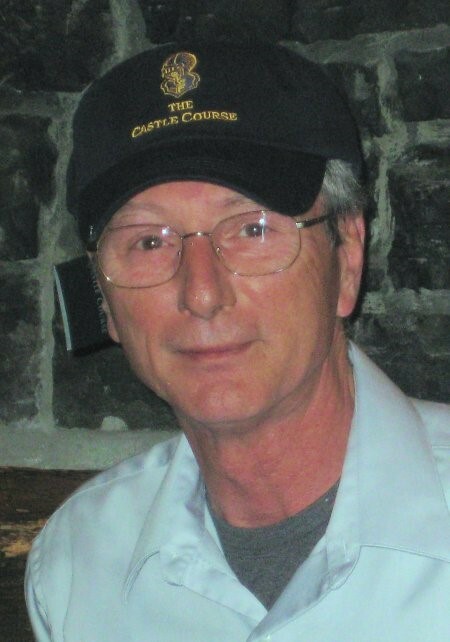 Jim later joined and remains a member of the CRAVEN DALE COUNTRY CLUB and is a Tournament Director. He has spent a lot of time playing uneven lies and enjoys them, adding that he tries to get others interested as well. "I sponsor uneven lies tournaments in my CC. To further encourage folk, I came up with a handicap system based on the USGA, complete with slope/rating. It must be working fairly well, as pretty much everyone who participates with any regularity has won a purse or two, offered for the winner and runner-up. I've given myself amateur status for these, so that should I win, the purses are passed down." "What's my real joy with WGT? I have plenty of time to watch videos and do surveys. I've amassed a load of free credits, thus the tournament sponsorships, but even more important is giving equipment to folk, especially those in countries where the free credits are slim to none. Christmas usually finds me searching the forums for worthy folk. A couple of years ago I noted a very memorable one. A guy posted that he really enjoyed the game, but was single-handedly raising three daughters. I took a look at his equipment and marveled that he had gotten as far as he had with no upgrades other than a putter. I bought him a driver and posted in the thread for him to look in his bag. The great thing was that it started a flood. Pretty soon, after other gifts arrived, he was sporting about the best his level could get." Something you may be surprised to learn about Jim is that he's an avid and (good) painter! 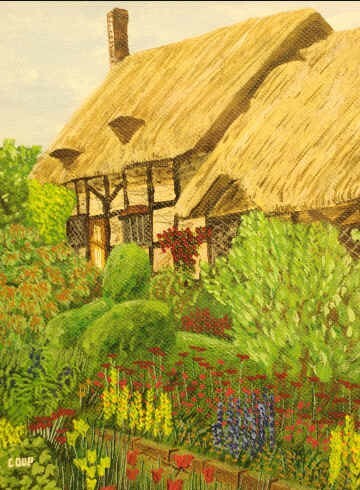 "No, I'm not famous, but I have sold a few paintings and commissions. Back in the mid-1980s, another artist asked if I'd put some work together and try to get a joint showing at a local gallery. So I dove in and started cranking them out on the weekends. One day, my wife looked over my shoulder while I was working. She said nothing then, but kept checking the work. I was getting close to finishing, when she claimed the painting, telling me that I wouldn't be selling it. (Of course the deal with the other artist didn't pan out.)" Thanks for sharing, Jim! You can check out the CRAVEN DALE COUNTRY CLUB HERE. WE WANT TO GET TO KNOW YOU! If you'd like us to feature you or someone you know in a future "WGT 19th Hole" profile, please let us know at: players[at]wgt.com. 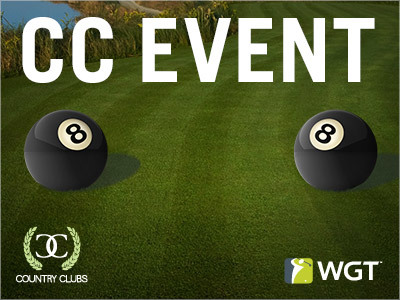 Join your WGT Country Club members and compete in CC Event #29, going on NOW through 8/19. You'll be competing against other clubs for club status and in-game rewards, including these new 8 ball tees and flags to use in country club tournaments! CC Event #29 runs 8/18-8/19, with multiple 4-hour Clashes, so be sure to play as many games as you can to earn points for your club and keep your eyes on the leaderboard. Get 20% More XP Today! You read that right – today only, get 20% more XP when you play WGT! To celebrate golf's return to that big sporting event going on right now, you'll earn 20% more XP just for playing WGT today. XP (experience points) helps you level up in the game, unlocking new equipment and features. The second tournament in the Jul-Sep Quarterly Season starts now! Post your first round score by 8/26. The top 70 scores in each Pro-Champion tier will split a total purse of 100,000 WGT Credits, and all credits earned in each monthly tournament are accumulated to determine your overall standing in the Quarterly Season.